Korporatio is introducing the idea of a Smart Company - a globally-connected and blockchain-compatible company with its own legal identity. In providing this service, Korporatio create legally recognised trading entities which can own assets, capital and employ people. Using smart contracts and blockchain technology, Korporatio already change the way that businesses start up and operate by removing bureaucracy and red tape that prevents progress. Korporatio is introducing the idea of a Smart Company – a globally-connected and blockchain-compatible company with its own legal identity. In providing this service, Korporatio create legally recognised trading entities which can own assets, capital and employ people. Using smart contracts and blockchain technology, Korporatio already changes the way that businesses start up and operate by removing bureaucracy and red tape that prevents progress. Through its integration of Blockpass’ KYC verification process into its proprietary platform, Korporatio offer seamless and compliant user onboarding for new users. 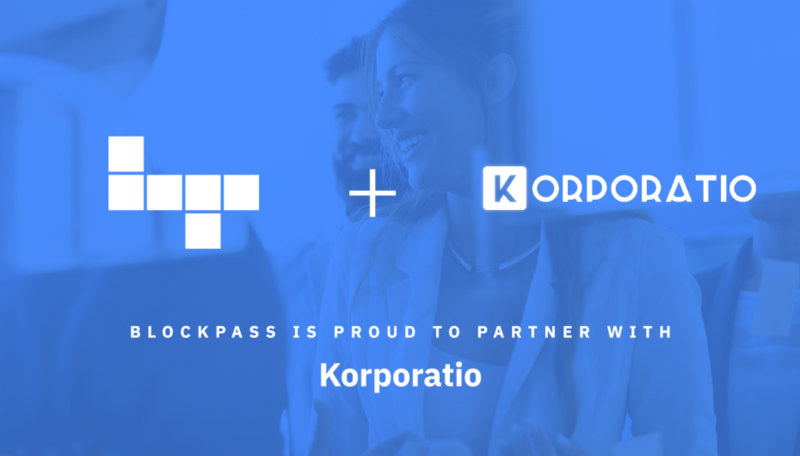 To celebrate the partnership, Korporatio will offer 40 free PASS Tokens for companies who incorporate using Blockpass seamless verification service, KYC Connect. For company registration via Blockpass KYC services made between 2nd of January to 9th of January, users will receive a 20% discount on Korporatio services. Korporatio joins a growing number of companies to enjoy Blockpass’ quick and easy KYC compliance solution which is increasingly being employed by Blockchain companies such as Infinito, GoSecurity and DSTOQ. Companies such as these, as well as Korporatio, are using blockchain technology to create global solutions in a tokenised and efficient economy.